Mem Fox is not on the official list of Australia’s National Living Treasures. That is plain wrong. It’s even more wrong given that Clive Palmer is on the list. Clive is large and full of money, but that’s the only way he could be considered a treasure. If we define the word as something precious and cherished, Mem Fox fits the bill. Possum Magic is the definitive Australian picture-story book, and probably only Graeme Base can rival her popularity over more than 30 years. 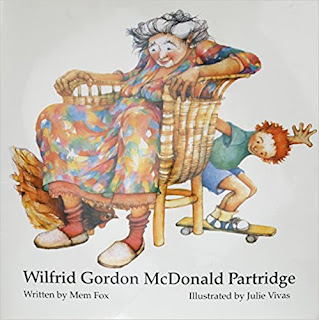 Today we look at another Mem Fox classic: Wilfrid Gordon McDonald Partridge. Wilfrid was published in 1984, the year after Possum Magic. They are the first two books Mem Fox had published, and they were both illustrated by Julie Vivas, whose style is unique and instantly recognisable – she too is an icon of Australian children’s literature. If Possum Magic was their blockbuster, Wilfrid was their sleeper hit. That’s because where Possum Magic is a fun, whimsical fantasy, Wilfrid is poignant and truly resonates. On its surface, it’s about a young boy who lives next door to a nursing home and befriends the residents. Deeper down, it’s about the fundamental truth that people are the same whether they’re 6 or 96. And usually, sadly, it’s only the six-year-olds and 96-year-olds who seem to understand that. The rest of us are stuck in the middle, too old to be innocent, too young to be wise, and too caught up in our day-to-day lives to give it much thought anyway. Wilfrid’s favourite friend at the nursing home is Miss Nancy Alison Delacourt Cooper, because she has four names just like him. One day, his parents call her a “poor old thing” because she’s lost her memory. Wilfrid wants to help her find it. He starts by asking the other residents at the home what a memory is. Old Mrs Jordan says it’s “something warm”. Mr Hosking says it’s “something from long ago”. Mr Tippett says it’s “something that makes you cry”. And so on. Taking this literally, as small children do, Wilfrid goes home to find some “memories” for Miss Nancy that fit the descriptions. And his little collection sparks her memory. The warm egg he brings reminds her of being a little girl and finding speckled blue eggs in a bird’s nest in her aunt’s garden. His grandfather’s medal reminds her of the brother she loved who went to the war and never returned. She marvels at how such a young boy could have brought these memories back. Heidi and Fletcher are fortunate that all four of their grandparents are still alive, and luckier still that they have two living great-grandmothers. One, who we call Grandma Millie, is 94, and just like Miss Nancy Alison Delacourt Cooper, lives in a nursing home. When we visit, it makes Grandma Millie’s day to see the kids. More than that, it brightens the day of every other resident who sees them. At a nursing home, little children are like a drug – the residents can’t get enough of them. Besides Grandma Millie, there’s old Jeannie from Northern Ireland, who was a high-school teacher and Skypes with her family back in the old country. She loves to say hello to the kids. There’s Alwyn, who always takes a grandfatherly interest. And Joyce, who likes to keep an eye out for Heidi too. And of course there are those who one day just weren’t there anymore. What must life be like in a nursing home? You have lived a long, eventful life, but you know this is the last stop. I remember, when I was five or six, my older sister Lindy would visit an elderly lady at Sunnyside House, the local nursing home. I would sometimes tag along, and without realising it at the time, I helped cheer them up in the same way. I remember one old man giving me a present of a big, men’s sized hankie, and a packet of Steam Rollers that fair dinkum knocked my socks off. I had a concept that these people were old, but it was still abstract. As far as I was concerned, everyone who wasn’t in school was old. And that’s the thing about Heidi, or Wilfrid Gordon McDonald Partridge. They treat the elderly like they would treat anyone. They treat them like people, like equals. Not feeling sorry for them, not wondering if this is the last time you’ll see them. The rest of us are coloured by what we think we know. “Poor old thing”, we think, and we act accordingly. Any visitors at a nursing home are welcome, but I wonder if kids are especially loved because they are so unaffected. A word here about Julie Vivas. Her style is so distinctive and her characters so expressive that they sometimes border on caricature, but in children’s books that can sometimes be a good thing. In Wilfrid it has the effect of bringing these old people to life, giving the sense of youth that is such an important message of the book. Yes, they are hunched over and frail, but they also have a recognisable spark. They are individuals, each with a story. And that’s the truth of a nursing home. I’ve been told countless times that you never feel any different as you age – not deep down inside. It should be obvious that Grandma Millie at 94 is the same person she was at 74, or 34, or 14. But too often we fail to think that way. We mentally group all old people together in one category. They’re not like us. We’ll never be like that. Wilfrid Gordon McDonald Partridge helps to remind us that we’re all the same. Old people have been young like us and we – hopefully – will grow old like them. If you have kids, and you have an elderly relative, it’s impossible to read this book and not feel inspired to pop around for a visit. So just do it. I guarantee you’ll make their day – and probably your own as well. One of my co workers with a young son just forwarded me your blog. I love it. You should read "I love you Forever". Would love to see your post on it. Thankyou! I haven't come across "I Love You Forever" but will keep an eye out for it.